I’ve been working a long time on some projects and now I’m trying to finish them in order to focus on new stuff! The first thing I did was edit the photo I made in my last workshop, the so called “fashion expert workshop”. Maybe this is not an usual photo for a fashion workshop… but actually, that makes me like it even more. Many times fashion pictures are kind of meaningless because there’s not a concept behind them, and personally I do not like empty pictures. In this photo I wanted to talk about the real beauty, the one which doesn’t care about established conventions. I wanted to talk about the crazy thinness of catwalk models and the absurd obsession of wearing an XS size. There’s beauty beyond XS, I swear. Prelight. I only had one mannequin so I couldn’t do a precise prelight…but even then I wanted to do it just to have the flashes roughly set before the shoot. “Sketch” photo. I set the camera on the tripod and composed the picture using 7 students instead of mannequins (remember, I just didn’t have 7 mannequins). This step was very important because it would define the entire photo composition and the depth that I would have in it. We did several tests and moved “mannequins” into many positions to find the one I liked the most. We marked the final positions on the floor. Iris and focus adjustment. The diaphragm would play an important role because I wanted sharp focus on the model and gradual defocus on closer and farther mannequins, but without being excessive. I finally decided that a 4.5 diaphragm was the best option, and I had to use neutral density filters in order to be able to have it. I shot with a 35mm lens. Lighting: Now with the exact positions of the mannequins set, I could polish the lighting. I’ll talk about it later. Clean Background: At this point everything was ready, so we cleared the set of students and started shooting. We needed a really large background and we only had one paper roll, so we shot it three times moving it in between each picture, just to combine them later and have a triple size background. Mannequins: using the marks we set before with the students, we photographed the mannequin in all the different positions. It was important to do it really carefully to preserve light coherence and perspective in the composition. Although we had previously shot a clean background, we put the background behind each mannequin so light inclusions would have the right tone and to have real shadows on the floor. All these details would make the composition easier in postproduction. Model: Last but not least, I photographed the model. I wanted her to imitate the position of the mannequins to look like she was one among them all. Her skin tone perfectly matched the tone of the mannequin, so we had no problems with light or exposure. Postproduction: I didn’t move the camera at all during the session and I always captured the complete frame, so in postproduction I just had to merge the layers and each mannequin was already in place and pretty well integrated. As you see, taking this picture is more complicated than it seems, especially because you need to be really conscious of what are you doing without seeing the complete composition. That’s the hard part of shooting in different layers! Actually we did it this way because I could only find one mannequin of this type… If we had had six mannequins we could have done all the picture in one shot. The result would have been the same, all I did was divide the photo into 8 layers: background, model and 6 mannequins. Everything has to be in it’s right place, you cannot just shoot the mannequin in the center of the frame and then move it in postproduction, because the gradation of light, perspective and focus will not work… everything has to be placed as in a one-layer photo. 1 – Octabox hung on a boom. This was the principal backlight for the front mannequins and overhead light for rear mannequins. 2 – Octabox hung on a boom: Main light. It didn’t lit the front mannequins. 3 – Softbox. Backlight for the model and the two mannequins on the left. 4 – White bounce umbrella. Really soft fill light for the two front mannequins. 5 – Softbox. It gives some backlight to the furthest mannequin on the right. 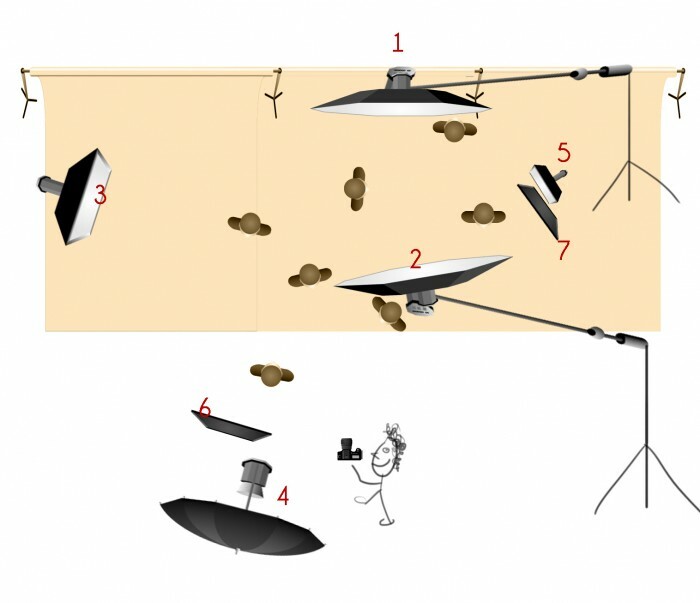 7 – Gobo to avoid lighting the floor with the softbox nº3. And that’s it! I want to thank Irene and the WorkshopExperience team for their amazing work and good vibe. I hope to upload new material soon, aloha!